Stanley and Katrina: February Promotion Details - Get Ready! Yes, our paws are dancing. We are able to release the details of the upcoming promotion that we have been lucky enough to join. Don't worry, we will post about this again when we reach the first FREE day of the promotion. Thanks again to Sally Harris for creating the promotion and including us in it! All of the fun details are below. Treat yourself and your kids with a special gift this Valentine's Day! This is a sample of 14 exciting middle grade stories that you will love and with the chance to win an e-reader. Competition opens 7 February 2013 and the winner will be announced on 14 February 2013. This e-book will be available to download for free for 5 days from the 7-11th of February and at 99c for the remaining days of the promotion. The winners will be drawn on 14 February 2013 and announced shortly thereafter. 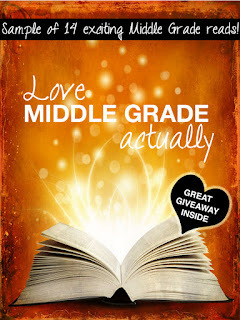 Whether you like fantasy, adventure, mystery or humor, "Love Middle Grade Actually" gives you a taste of it all!